Well-respected and seasoned prophetic leader, Kris Vallotton, provides a practical guide that has become a staple resource in training all believers to operate in prophetic ministry. 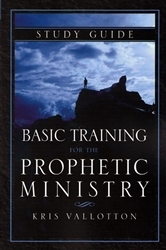 Ideal for personal study, small groups, and church classes, Basic Training for the Prophetic Ministry Study Guide is your guide to understanding and operating in the prophetic ministry. Get ready to hear God’s voice in a fresh way, speak His word with power, and release hope, life, and destiny to those around you! Day 2: What Day Are You Prophesying From? Day 30: What Kinds of Fruit Are Your Prophecies Producing? Kris Vallotton is the senior associate leader of Bethel Church in Redding, California and has served on Bill Johnson’s apostolic team for more than thirty-four years. He has written nine books, including the bestselling Supernatural Ways of Royalty and Spirit Wars. Kris’s revelatory insight and humorous delivery make him a much sought-after international conference speaker. Kris and Kathy Vallotton have been happily married since 1975. They have four children and eight grandchildren.